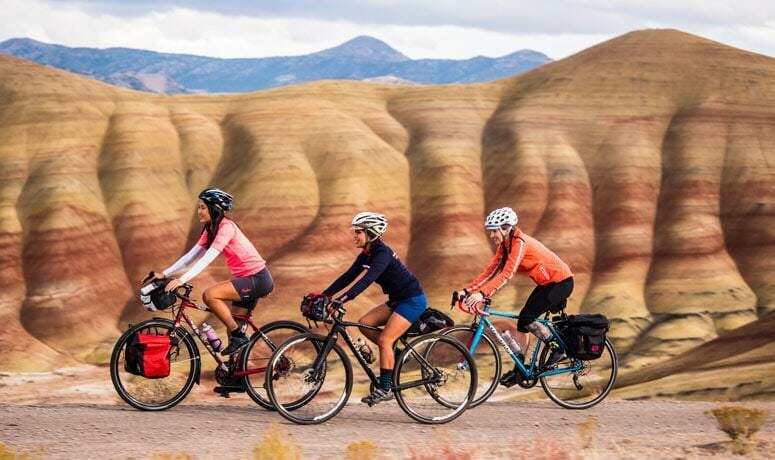 If you’re in central-eastern Oregon with the luxury of time to explore by bicycle, the Painted Hills Scenic Bikeway offers days’ worth of jaw-dropping scenery, challenging ascents and thrilling descents, and small-town hospitality in all directions. This is some of the most spectacular geography and geology in the state, yet it’s lightly populated and visited. Bicycling through the Painted Hills reveals millions of years of history in the layers of earth, one color at a time. The hills get their name from the delicately colored stratifications in the soil of yellows, golds, blacks and reds, formed by shifting volcanic islands. A closer look reveals ancient plant and wood fossils. Besides the number of times you’ll pull over to capture the sometimes-subtle, sometimes-vivid landscape in a photo, you can spend time pedaling and pondering, trying to wrap your brain around the span of time you’re seeing evidence of all around you. 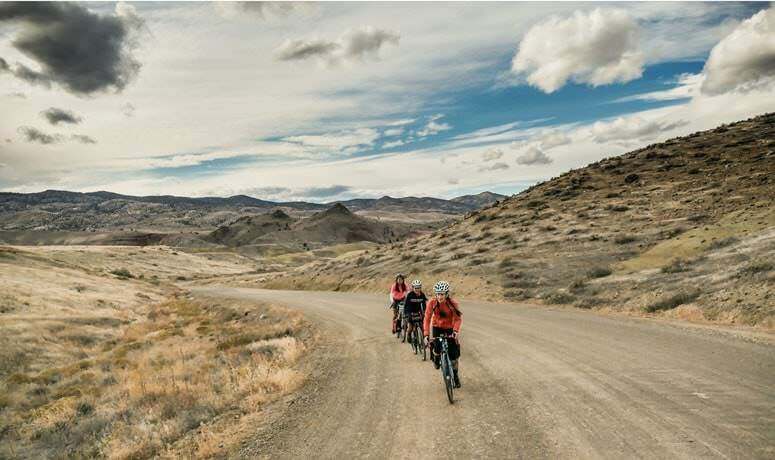 This Scenic Bikeway was designed to connect all three units of the renowned John Day Fossil Beds, which hold the world’s best fossil record of the Age of Mammals (the last 50 million years) and exhibit a dramatic record of past climate change. As you plan how to navigate your riding, make sure to build in time to spend at each unit you ride to; experiences like walking the boardwalk at the Painted Hills Unit amid a rainbow of rock are not to be missed. 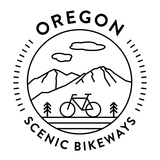 The Bikeway features a hub-and-spoke design that offers a series of rides and loops, which easily connect for longer tours on largely low-traffic roads. The official map and cue sheet details several shorter segments, as well as the entire Scenic Bikeway. You can start and end your ride in any of the communities on the Bikeway; each has the amenities and supplies you need, plus a small town to explore. Beyond each town, it’s just the sounds of birds and the quiet. Different segments offer different pleasures. The stretch from Service Creek to Spray and Kimberly takes a sinuous path alongside the John Day River. 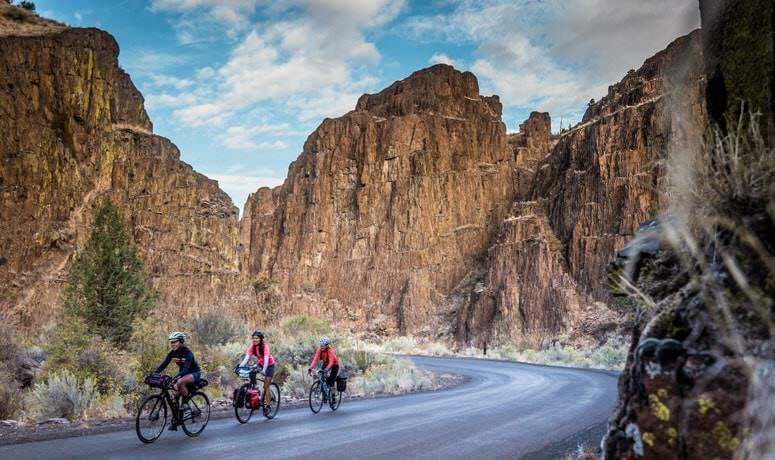 From Service Creek to Twickenham involves climbing the stout Donnelly Grade, and later dropping down into a Wild West landscape of rocks and sagebrush to a crossing of the John Day. Riding to Mitchell puts you in the shadow of the imposing Ochoco Mountains, through the historic town and on to the Painted Hills Unit. 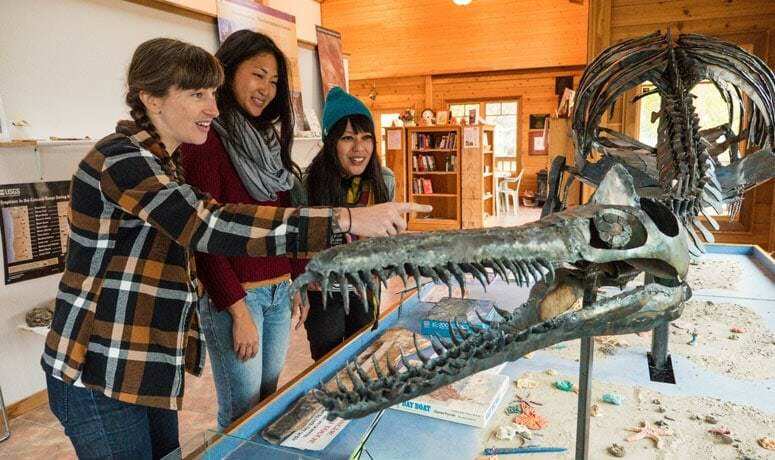 And the town of Fossil, adjacent to the Clarno Unit, offers the chance to dig up your own fossil. Water stops are limited to towns, except for the three Highway 19 parks between Fossil and Service Creek (see map), and the Painted Hills picnic area. Find more to see and do near this Bikeway at Eastern Oregon Visitor Association and Travel Oregon: Painted Hills. Camping is available at Shelton Wayside County Park and three other sites between Fossil and just past Service Creek, as well as two sites between Service Creek and Kimberly. There are lodging options in Fossil, Mitchell, Service Creek, Spray and Kimberly.